Glen Rose has several hotels, as well as cabins, lodges, and Bed & Breakfasts. 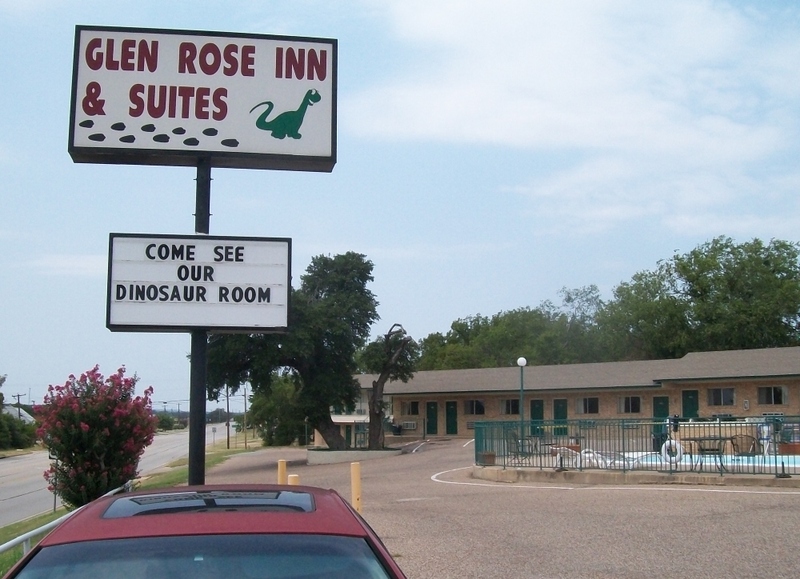 A clean, modern, economical motel that I recommend is the Glen Rose Inn and Suites. Located right on Route 67 (300 Big Bend Trail)--just a few miles east of the state park, the model features a large outdoor pool, and each room includes a min-fridge. Also available is a special "Dinosaur Suite" with wonderful prehistoric decor. Phone 254-897-2940 or 254-898-8800. If you are looking for a charming Bed and Breakfast, Country Woods Inn is situated right on the Paluxy River, just south of the town square. If you do not find a place to stay in Glen Rose, there are many other accommodations in Granbury, a somewhat larger town about 15 miles north.